Each day, your baby is starting to get more and more active. So, you want to provide your little one with a safe place to play and the baby gear option at the top of your list to purchase to do that is the Graco Bumper Jumper. Yet, you’re still a bit hesitant to pull the trigger since you’re still not entirely sure if it’s exactly what you’re looking for. Well, to put your mind at ease here is a complete review of this baby jumper, which should help you make your final decision on whether or not to get it. 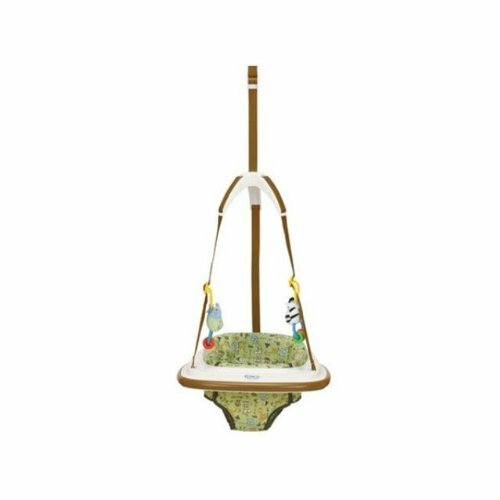 Although this baby jumper is one of the more basic options available when it comes to baby gear, it still has quite a few features and benefits that make it a sound buy. A no-mar clamp that is spring loaded and has height adjustments. Designed to be attached to any thick door frame. Seat with a high, supportive back. Removable nylon seat cover that can be washed by hand or in a washing machine. Easy to attach and take down, making it a portable option to use anywhere in your house. It can be used throughout the beginning year, even years, of your child’s life since it has height adjustments and can be used by a little one weighing up to 25 lbs. Offers your child a safe place to play and get rid of excess energy. Stimulates your child’s physical development since it comes with toys that he or she can try to grab and hold. It’s an inexpensive baby jumper that’s easy to use. It has a decent appearance thanks to its fun baby themes including a jungle motif. Set-up doesn’t take very long. An entertaining way to keep your child busy. Since it is so inexpensive, it’s not quite as durable as some more advanced jumpers. Since the toys are removable, they can easily be lost. Even with the plastic dome that covers the straps, sometimes they can get tangled. You’re limited on places it can be used since it has to be hung from a doorway. Given that the Graco Bumper Jumper is typically purchased by parents for their children to use, we were extremely interested in what parents had to say about this baby equipment option. After doing some digging online. Parents thought it was well-constructed and durable, yet, we’re still a little leery when using it since they didn’t like the fact that sometimes, their children would tip over when using it. One thing that everyone seemed to like was how it could be easily moved. Some parents didn’t think the instructions were as detailed as they could have been. Almost all the parents liked the styling of the jumper. When purchasing anything, whether it be a baby jumper other items for your child, it’s always a good idea to be intelligent about what you’re doing. For example, you don’t want to overpay for what you’re looking to buy since you don’t feel like going to more than one store. Therefore, to help you be intelligent about purchasing things. Always do price comparison shopping to prevent overpaying. Get other people’s opinion when buying anything so you don’t have tunnel vision, thinking that something is a good buy when it really isn’t. Shop online to avoid big crowds. Always set a limit on your spending. By reading this review, you should now have all the information that you need to make a decision on whether or not this jumper is the one that you want to get for your child. If it is, in fact, the one you want, buying online is the easiest way to do it, as pointed out earlier since you’ll be able to find the Graco Bumper Jumper at the best possible price. Plus, it will be shipped directly to you, so, you don’t have to deal with having to waste time going out to a store.